You just can’t keep these two apart. As though it was meant to be. Love at first sight? 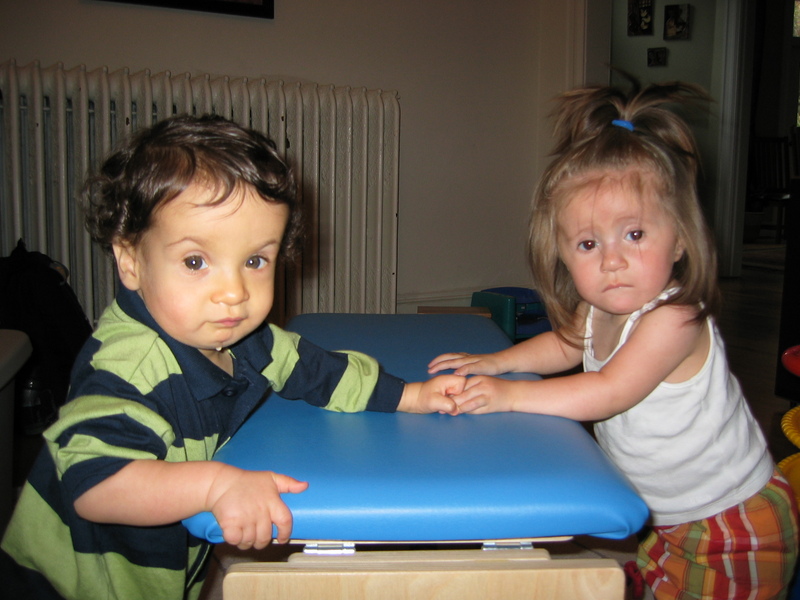 The Buddah and Mabel hold hands at their very first meeting, November 5, 2003. They had both turned 1 just the month before. Yep, The Buddha and Mabel are together again. Their school got a few more students, and a classroom shuffle brought these two cuties back into the same class. More precisely, The Buddha got bumped up into Mabel’s class (while several older kids formed a new class), which positively challenges him on so many levels. Socially, academically and physically, he’s being pushed to up his game. And so far, so good. Except the math homework. That’s pretty much torture for all involved. The Buddha’s classroom move across the hall happened smoothly on the heels of a successful joint birthday party (originally planned back in August, when we thought the two of them would be in the same class from the start). A fantastic kids yoga teacher led our two serious little yogis and their classmates through deep breaths and downward dog and yogic interpretations of “The Sound of Music” (a Mabel favorite) and robots (a Buddha selection). The two birthday kids stretched and bent and posed next to each other the whole time and then sat together for pizza and cake (a princess vanilla cake for Mabel and a Wall-E chocolate for The Buddha). Uniting forces for this celebration no doubt doubled the fun and the positive party energy. With our two new 8-year-olds presiding together at the head table, Mabel’s mom and I joked a about this party being a rehearsal for their wedding. We’ll try not to get our hopes up too high. Where in your life could a uniting of forces push you to grow — socially, academically, physically, spiritually? Thank you, Carole! You’re so sweet. Don’t count you chickens, er, chicks… We had figured on an early friend as a match for our first born, and are now happy that it did not work out that way. We love the unplanned alternative!